425 Marlborough is located on the north side of Marlborough, between Massachusetts Avenue and Charlesgate East, with 421-423 Marlborough to the east and 427 Marlborough to the west. 425 Marlborough was designed by architect Obed F. Smith and built in 1886-1887 by Charles A. Dodge, mason and builder, one of three contiguous houses (425-427-429 Marlborough) built for building contractor George Wheatland, Jr., for speculative sale. He is shown as the owner on the original building permit applications for all three houses, all dated October 14, 1886. As originally built, all three were three stories in height, probably all of the design which survives at 429 Marlborough. By the mid-1890s, and possibly even before they were occupied, additional stories had been added to 425 and 427 Marlborough. All three houses show as three story houses on the original permit application and on the 1887 Sanborn map, but 425 and 427 Marlborough show as having four stories on the 1897 Sanborn map and 1898 Bromley map. George Wheatland, Jr., purchased the land for 425-427-429 Marlborough on June 7,1886, from Henry Lee, H. Hollis Hunnewell, and Augustus Lowell. The land was part of a larger parcel that Henry Lee and his partners purchased on February 20, 1883, from a real estate investment trust formed by Grenville T. W. Braman, Henry D. Hyde, and Frank W. Andrews. The parcel was one several tracts of land the trust had purchased from the Boston Water Power Company on March 1, 1872. 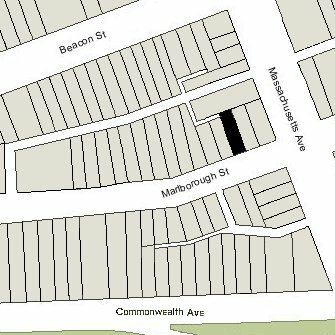 Click here for an index to the deeds for 425 Marlborough, and click here for further information on the land west of Massachusetts Avenue between the south side of Beacon and the north side of Commonwealth. In subdividing their land, Henry Lee and his partners had created two passageways to provide access and drainage to the alley for 425-427-429 Marlborough: a four foot wide passageway behind 427-429 Marlborough connecting with a six foot wide passageway behind 31 Massachusetts Avenue extending north to the alley. Unlike similar passageways elsewhere in the Back Bay (for example, at the rear of houses facing on the side streets), these passageways were not created as easements over the lots, but as separate open spaces “appurtenant to the granted premises” to which each property owner had access in common with the owners of the other the abutting properties. On October 18, 1887, 425 Marlborough was purchased from George Wheatland, Jr., by Edward Burgess. He and his wife, Caroline Louisa (Sullivant) Burgess, made it their home. They previously had lived at 443 Marlborough. The Burgesses had moved by the 1888-1889 winter season, and by the 1889-1890 season were living at a new home they had built at 503 Beacon. On August 4, 1888, 425 Marlborough was acquired from Edward Burgess by attorney Amos Lawrence Hatheway. He and his wife, Cora L. (Moulton) Hatheway, made it their home. They previously had lived at 263 West Newton. On November 12, he transferred the property into his wife’s name. 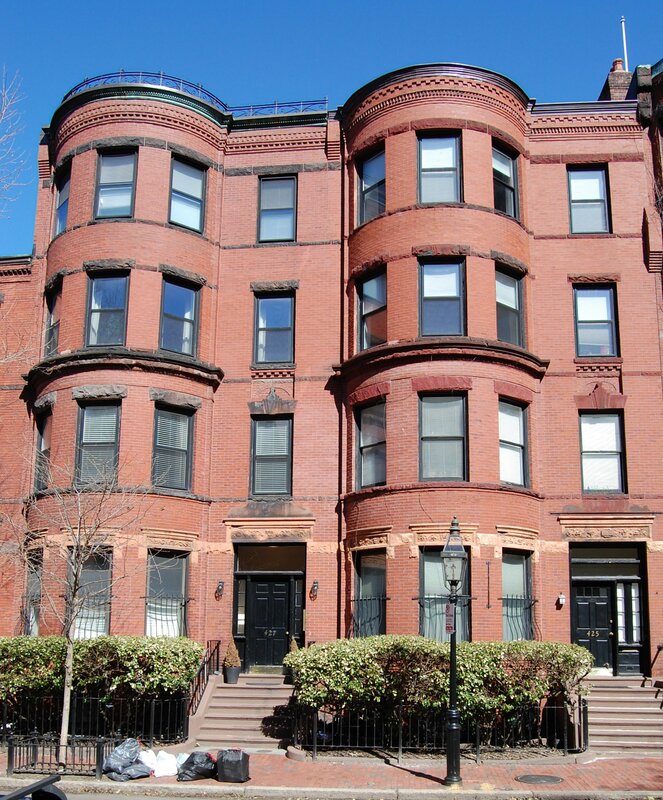 They continued to live at 425 Marlborough during the 1896-1897 winter season, but moved thereafter to Brookline. Cora Hatheway continued to own the house and lease it to others. 425 Marlborough was not listed in the 1898 and 1899 Blue Books. By the 1899-1900 winter season, 425 Marlborough was the home of Sarah H. (Robbins) Crosse, the widow of Charles W. Crosse. 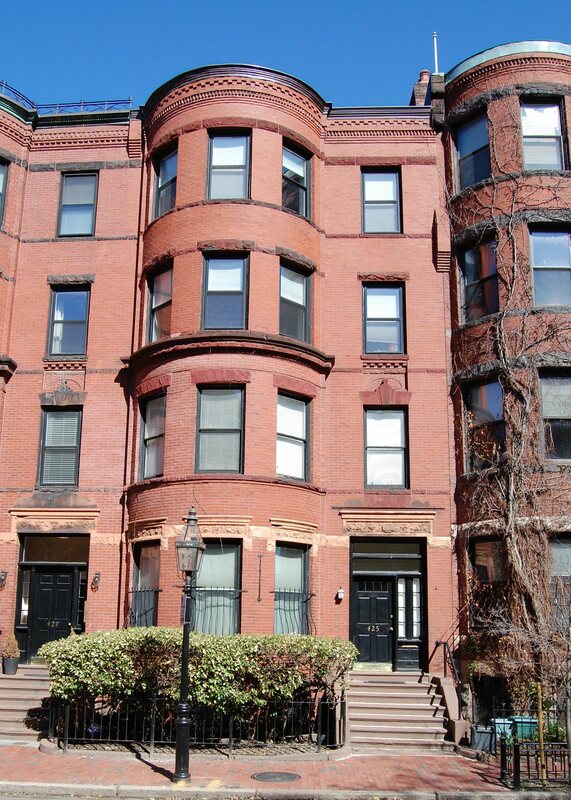 She previously had lived at 845 Boylston and before that at 6 Marlborough. She continued to live at 425 Marlborough during the 1900-1901 season, but moved thereafter to The Wadsworth (Newbury, corner Kenmore). Also during the 1899-1900 winter season, 425 Marlborough was the home of Henry W. Foster and his wife, Emma G. (Brooks) Foster. They previously had lived at Exeter Chambers (southeast corner of Exeter and Blagden). He was a wholesale grocer. They had moved by the 1900-1901 season, and by 1902 were living at 2 Louise Park. By the 1901-1902 winter season, 425 Marlborough was the home of Sarah Frances (Miller) Richardson Mason Firmin, the widow of Joseph E. Richardson, Aaron Mason, and David Holley Firmin, and the former wife of Joseph B. Turner (whose name she did not keep). She continued to live there during the 1903-1904 winter season, but moved thereafter. During the 1904-1905 winter season, 425 Marlborough was the home of Mrs. L. Katharine Wright. She previously had lived at 11 Albemarle Chambers. 425 Marlborough was not listed in the 1906 Blue Book. By the 1906-1907 winter season, 425 Marlborough was the home of Dr. Frederic Jay Cotton, a physician, and his wife, Jane (Baldwin) Cotton. He also maintained his medical office there. They previously had lived (and he had maintained his office) at 416 Marlborough. Frederic Cotton was an orthopedic surgeon specializing in reconstructive surgery, and a professor of surgery at Harvard Medical School. He was a founder and regent of the American College of Surgeons. They continued to live (and he to maintain his office) at 425 Marlborough during the 1908-1909 winter season. In 1909, they moved to an apartment at 224 Marlborough and he moved his office to the Hotel Cambridge at 483 Beacon. By 1913, they had moved to Brookline, and in 1915 they purchased and moved to 239 Beacon. By the 1909-1910 winter season, 425 Marlborough was the home of Dr. Nellie Louise (Macomber) Lawrence, the former wife of David Ellis Lawrence. N. Louise Lawrence was a physician. She maintained her office at 425 Marlborough and also operated it as a lodging house for nurses. She previously had lived and maintained her office at 18 Huntington. By 1911, she also sublet office space to at least two other physicians, Dr. Leo V. Friedman and Dr. Henry Tolman, Jr. They both lived in Allston. N. Louise Lawrence continued to live and maintain her office at 425 Marlborough during the 1912-1913 winter season, but moved thereafter. Dr. Tolman continued to maintain his office at 425 Marlborough until about 1914, when he moved it to 543 Boylston. Dr. Friedman, who also was a professor at Tufts Medical School, continued to maintain his office at 425 Marlborough until about 1923, when he moved it to 15 Bay State Road. After Dr. Lawrence moved from 425 Marlborough, the lodging house was operated by Miss Ellen A Stowe, a nurse, who had lived there as a lodger from about 1910. It continued to be a lodging house for nurses. Amos Hatheway died in July of 1921, lost overboard from the steamer Richard Peck in Long Island Sound. On June 15, 1922, 425 Marlborough was purchased from Cora Hatheway by real estate dealer James M. Burr, and on April 5, 1923, it was acquired from him by Mary (May) Theresa (Fagan) Baillie, the wife of Chauncey Herrick Baillie, as trustee of the Baillie Realty Trust. They lived at 16 Westland Avenue, where she managed the Ansonia Apartments. Chauncey Baillie died in 1925 and by 1927 she had moved to 591 Beacon, where she managed a lodging house. Ellen Stowe continued to live at 425 Marlborough and operate it as a lodging house for nurses until about 1927. In about 1928, she resumed her nursing career. She continued to live at 425 Marlborough. By the 1927-1928 winter season, 425 Marlborough was the home of Miss Helen Goodell Medbury, who assumed responsibility for operating the lodging house. She previously had lived at 839 Boylston, where she was registrar of the Boston Nurses Club and Registry. On January 14, 1928, 425 Marlborough was acquired by William D. Gage, the proprietor of the Hotel Belmont at 116 Huntington, where he also lived. He was unmarried. Helen Medbury moved to 427 Marlborough, where she continued to operate a lodging house for nurses. Ellen Stowe, and many of the other nurses who had lived at 425 Marlborough, moved there with her. In 1928, 425 Marlborough became the home of Clyde Eugene Hipple and his wife, Eva Pearl (Nosker) Hipple. They previously had lived at 272 Newbury. Eva Hipple’s sister, Luella (Nosker) Clinton, the widow of John Clinton, lived with them. The Hipples operated 425 Marlborough as a lodging house. The Hipples separated in the early 1930s. Clyde Hipple moved to Pompano, Florida, and Eva Hipple moved to Allston. Luella Clinton moved with her. By 1931, 425 Marlborough was the home of William J. Mills and his wife, Sadie B. Mills, who operated it as a lodging house. They previously had lived in Georgia. William Mills died in September of 1931. Sadie Mills moved soon thereafter. By 1933, 425 Marlborough was the home of John (Jack) J. Mills and his wife, Hazel Beatrice (McIntyre) Mills, who operated it as a lodging house. They previously had lived in an apartment at 421 Marlborough, where they also accepted lodgers. In 1928, they had lived and operated a lodging house at 441 Marlborough. John Mills does not appear to be closely related to William J. Mills, who had lived at 425 Marlborough at the time of his death in 1931. John Mills died in November of 1934. Hazel Mills continued to live at 425 Marlborough and operate it as a lodging house. William Gage died in May of 1941, and on June 1, 1942, Hazel Mills purchased 425 Marlborough from his estate. She continued to live there until her death in December of 1952. On May 6, 1953, 425 Marlborough was purchased from Hazel Mills’s estate by Albert Leo Hollingdale and his wife, Margaret E. (Tabor) Hollingdale. Later that month, they also acquired 427 Marlborough. They operated lodging houses at both addresses. The Hollingdales lived at 82 Bay State Road. They also owned 517 and 519 Beacon), which they operated as lodging houses. In June of 1953, Albert Hollingdale applied for (and subsequently received) permission to cut openings between 425 Marlborough and 427 Marlborough on the basement and first floor levels. By the mid-1950s, 425-427 Marlborough were operated as the Tabor Hall dormitory, and 517-519 Beacon were operated as the Hollingdale Hall dormitory. On August 25, 1955, the Hollingdales transferred 425-427 Marlborough and 517-519 Beacon to themselves as trustees of the Hollingdale Hall Trust. In June of 1958, they acquired 503 Beacon. On September 1, 1960, 425-427 Marlborough, 503 Beacon, and 517-519 Beacon were acquired from the Hollingdales by real estate dealer Hugh Richardson Farrington and his wife, Clara Marcellina (Cormier) Farrington, as trustees of the Hugh J. Trust. In November of 1961, they acquired 521 Beacon. The Farringtons operated 425-427 Marlborough and 517-519-521 Beacon as dormitories for Boston University students. In September of 1960, the Farringtons sold 517-519-521 Beacon. They continued to own 425-427 Marlborough. On April 28, 1969, 425-427 Marlborough were purchased from the Farringtons by Kenneth L. Shaw. He lived in an apartment at 464 Beacon and operated 425-427 Marlborough was lodging houses. He also owned 445 Marlborough, a seven unit apartment house. On January 2, 1973, 425-427 Marlborough were purchased from Kenneth Shaw, by then a resident of St. Michaels, Maryland, by William Vinal and Alfred J. Greenwood. They had purchased 445 Marlborough from him in July of 1972. William Vinal lived at 427 Marlborough and operated 425-427 Marlborough as lodging houses. Alfred Greenwood, a mechanical engineer, lived at 25 Cumberland. On April 2, 1977, Alfred Greenwood acquired William Vinal’s interest in 425-427 Marlborough and assumed operation of the lodging houses. He also acquired William Vinal’s interest in 445 Marlborough. Alfred Greenwood continued to live at 25 Cumberland. On May 14, 1986, 425 and 427 Marlborough were purchased from Alfred Greenwood by Edgard Puente, Gary L. Schechtman, and Sidney Kreitzer. On June 27, 1987, they converted both buildings into condominium units, five in each building, the 425-427 Marlborough Street Condominium.